I’m a nostalgic man. I am also a highly superstitious man who is not in the slightest religious. The Gaslight Anthem is one of my favorite bands currently making music, and I never miss the chance to see them perform live. Usually when they play Seattle it’s at the end of September or the beginning of October in support of their newest album. 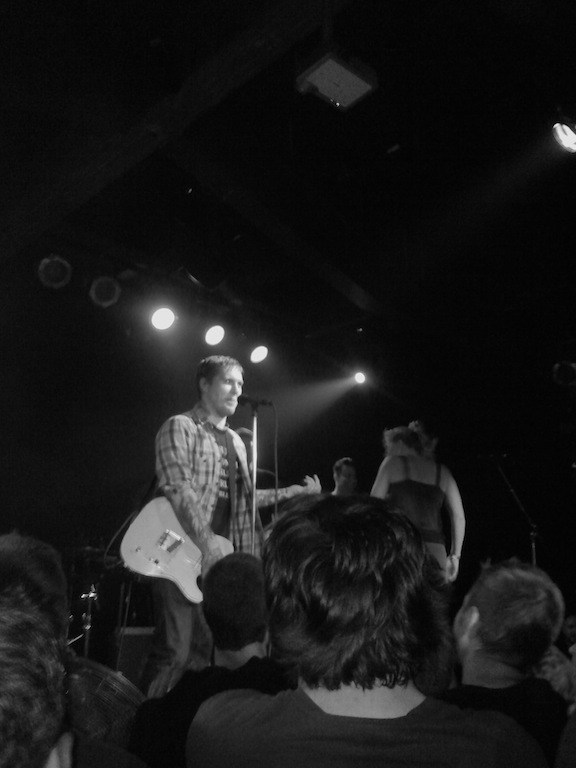 They play one of the larger all-ages venues, and I use the show as a eulogy to a season that has just passed. I drink beers in the bar area and come up front and sing Brian Fallon’s words back at him as if he didn’t know them already. I’ve seen Gaslight three times prior to last night’s performance. When I make reference to myself not being religious, it’s not a frivolous statement – The Gaslight Anthem is the church of punk rock and roll. I’ve been baptized in the sweat of six hundred strangers. And brother. . . Brother, I am saved. 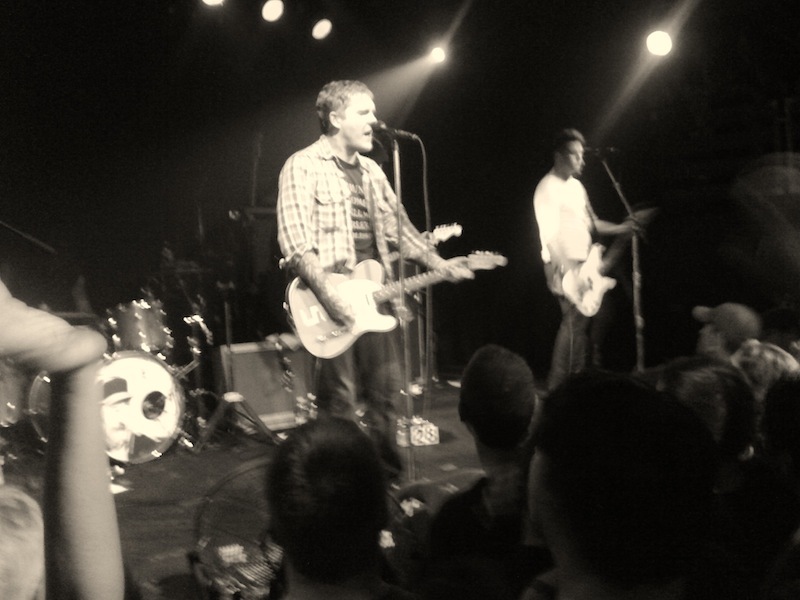 With every new release, The Gaslight Anthem seems to get bigger and bigger. Being a band with working class punk roots, The GA wanted to do a smaller club tour before their new album, Handwritten, drops at the end of this month. It will surely rocket them into yet bigger venues, but lose touch with the sweat and intimacy of smaller stages and rabid believers that know every word to every single song. That is what brought them to Seattle’s Crocodile this past Sunday night, performing to a sold-out room of adoring fans foaming at the mouth for that savage séance only achieved through the prayer of the sing-along. It was almost 80 degrees outside, hot for Seattle. The room was packed when opener Dave Hause came out to do an acoustic set. He fronts New Jersey band The Loved Ones, and had a pretty good following nodding along to his earnest folk punk a la Fifteen, Lit and Rise Against. Even in the palpable heat and overcrowded conditions, the audience had that “we’re all in this together” vibe. Smiles and applause all around. When someone stepped on your foot or accidentally knocked over your PBR, they apologized profusely. We’re in church here after all. When The Gaslight Anthem took the stage promptly at 10:30 they had immediate attention of the crowd. Throngs of girls and boys, men and women with rounds of drinks pushed their way forward into the bouillabaisse. The preacher was in the pulpit. The sermon was to begin. Starting with “Great Expectations” off their beloved The ‘59 Sound album, the crowd was in thrall. I stood stage left with my own parcel of PBRs, trying to observe the show as a reporter. I did my job valiantly for the first few songs, trying to capture some photos with my phone and look at everything with a discerning eye. The fourth song was “Angry Johnny and the Radio” I put my phone back in my pocket, left my beer and pogoed my way up front. I ain’t been to church in nigh on twenty years, but I never remember any cameras being there. This is salvation. My rock redemption. And I have to be right there singing his words to him, lest he forget them. The Gaslight Anthem played for an hour and a half. The whole room before them writhing and jumping and singing along at the top of their lungs. This was not a “pit” in the usual sense of the word. We were all laughing, and smiling, and cheersing our beers. Stopping all movement when someone lost their glasses on the floor. By the end of their encore set, everyone in the pit had embraced, or hugged, or smiled at one another while yelling lyrics in each other’s faces. The beautiful girls swooning dreamily, and heaping heavy accolades on Brian Fallon with their eyes. The man had to mention that he’s married several times, yet still girls jumped on the stage – one even doing cartwheels, and wouldn’t leave until Fallon sated her with the promise of free T-shirts from the merch booth. We were having a great time in church; we never wanted it to end. Our sweat had been shared and passed like communion, our mutual love unrequited. The Gaslight Anthem saw fit to end this encore set with “We Came to Dance” into “The ‘59 Sound.” Glossolalia ensued. Written by: Dagmar on 07/15/2012. This entry was tagged m. crossley, the crocodile, the gaslight anthem. Bookmark the permalink.